Dr. Charles Nottingham, Cosmetic Dentistry Fort Lauderdale, donated to the Wyland Foundation. The foundation encourages environmental awareness through education programs, life-size public arts projects, and community events. Inspired by the work of Jacques Cousteau, Wyland began painting the underwater realm in the early 1970s, hoping people would respond to his work’s message of environmental responsibility. Today, he is the world’s most widely collected marine life artist, internationally renowned as a pioneer of the environmental art movement. An estimated one billion people view his artwork each year — particularly the mommoth Whaling Wall murals he paints to promote the preservation of the oceans and their creatures. His art captures whales, dolphins, sea turtles, manatees and reef life in their natural habitat, alive with spirit and grace. Wyland’s paintings and sculptures are known for their vivid coloraboration, true-to-life detail, and the soul that shines through the eyes of each marine creature portrayed the eyes of each marine create portrayed. A passionate diver, he spends innumerable hours each year swimming with aquatic inhabitants, drawing inspiration that fuels both his art and his life. 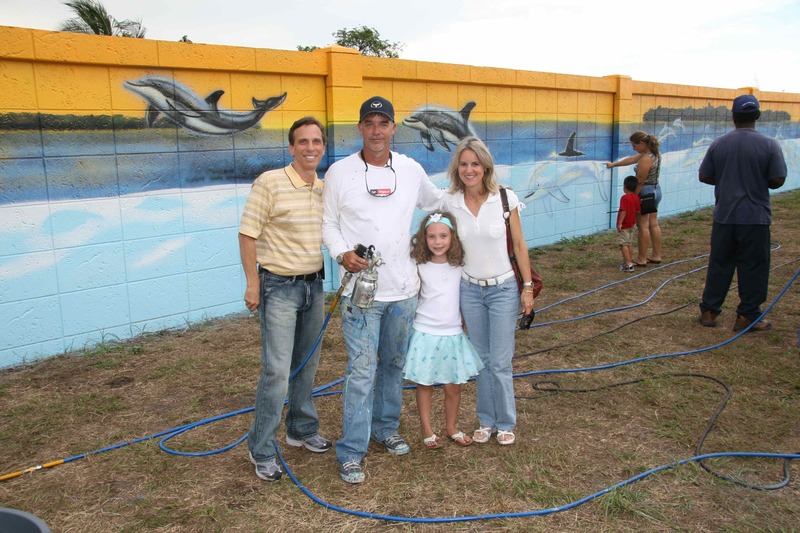 The City of North Lauderdale dedicates this mural on June 14th, 2008, as a reminder of the wonders of nature and the need to preserve them for future generations. The mural on Wyland Walk was created by the world famous artist Wyland, whose monumental Whaling Wall project is a series of 100 life-size marine life murals that span twelve countries on four continents. This wall is the 99th mural created out of 100. To donate to the Wyland foundation, go to https://www.wylandfoundation.org and click donate.